Having spent the last year working on the redesign and search logic for the new YellowPages.ca, which launched on Oct 12, 2009, I wanted to share some of the most interesting search queries that I have seen come through our log files in the past couple of weeks. These are all PG rated, believe me we get NSFW entries, but I will exclude those from this list. Click here, if you want to skip my introduction and get right to the list of Searches. Before jumping into the list, I want to send a thanks to all the teams that worked on bringing this together. The biggest learning from this Lose Weight Exercise is that most people I talk to ask me why this would take so long, “I mean come on, its a website, anybody can do website design”. The actual process of building and testing was relatively short, however, the logic streams behind the platform where the most timing consuming; planning, coordination and communication. For end users, this site either works or it doesn’t. If they find what they needed, then their local search is successful. If they conduct a search and cannot find what they wanted, then we failed. When I say this was the biggest launch in my career, here’s why? Think of these numbers; 400K advertisers with content that needs to be mined, 1.2M business listings, over 200M+ in online revenue, over 7M Canadian per month that rely on yellowpages.ca for their local search engine (source: Yellow Pages Group Financial Statements). To say that relaunching yellowpages.ca has expectations is an understatement, but a great challenge and overall response has been extremely positive. The underlying premise behind this relaunch was very simple: a) YellowPages.ca has vast amounts of local business content (remember only 50% of CDN businesses have a website, that’s around 500K and I would argue a good 1/3 of those have extremely stale data) that we need to get in front of consumers and b) make the site more geographical relevant to the neighborhood, landmark and lat/long perspective. By opening up more of the data and creating the intersection with geographical associations, I believe Canadians will have a much better local experience. To sum up the majority of what our users are saying, “It just works, thanks”. If you have not already checked out the redesigned home page, here is the screenshot. We moved all the key aspects of what a user wants directly to the front, based on a lot of user research. For Business Search you can search via What/Where, Reverse Phone Look-Up, Map and Driving Directions. For People Search you can search via Who/Where, Reverse Phone Number, Map and Driving Directions. On the business side you can also click navigate through Business Locations or Business Category. Here are some of the most interesting local searches that users are now conducting on the new YellowPages.ca. If you want to see the results that go along with those searches, click below, some are quite interesting. Hemorrhoids, Port Coquitlam – nothing to say here, but buddy go get them checked out. Phobias, Lake Country – somebody in the Kelowna area has issues they need to dealt with. Nudism, Ontario – I was surprised at how many places in Ontario you can go au natural. Nuclear Waste, Mount Pleasant – this is a neighborhood in Toronto, I hope they don’t actually have nuclear waste. From the result set, seems they were looking for Nuclear Waste Management Organization which is located around this neighborhood – who know? 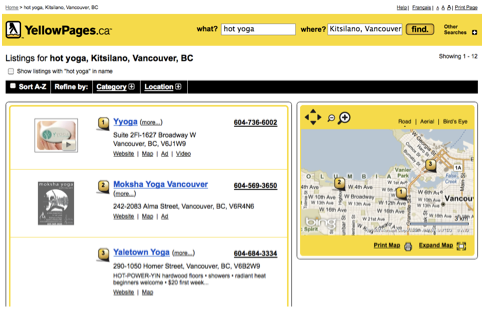 Hot Yoga, Kitsilano – I put this one in, because current I am on a hot yoga in Calgary kick and it seems that Hot Yoga searches in general are picking up steam on YellowPages.ca. Non Toxic Toys, Calgary – Either this is an over cautious parent or a couple looking for an interesting evening. I think it is the latter. Drunk from Drinking, Winnpeg – that is usually what happens when you participate in this activity. For this user, perhaps an alternative search would be DUI lawyer, Winnipeg. Handicap, Vancouver Heights – this is a neighborhood search in Burnaby – I wonder if they were looking for wheelchair information or not. Fair Trade Coffee, Bell Centre – the search term, Fair Trade Coffee is really increasing, especially on our iPhone Application. I wonder if this was a native Montrealer or somebody visiting Montreal. Based on the search query time, appears to be before the Montreal Canadians game. Dog Protein, Toronto – I put this one in because as an owner of a Cocker Spaniel, I can personally say I never searched this one before, but I suppose it makes sense if your dog is not getting enough protein in its diet. 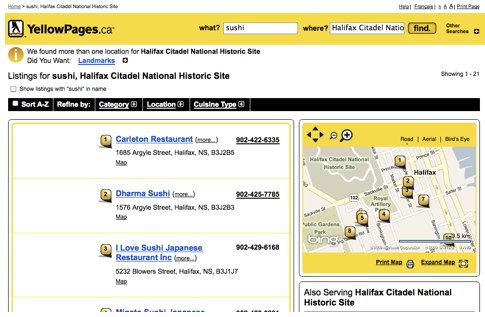 Sushi, Halifax Citadel National Historic Site – I thought this was a pretty cool query and really demonstrates a true local search. Probably a tourist in Halifax. Ugly, Canada – I think this was a joke search, but one observation from my end – why are all the businesses with Ugly in their name located in Western Canada? Investigate Cheating Wife, Montreal – I think that search term says it all. You go buddy – you find out what she is up to. I suspect the next query should be Divorce, Montreal. Invertebrates, Gloucester – I thought this was an interesting search. For those of you who don’t know, Gloucester is a connecting city to Ottawa. Sprocket, Lessard Park – Lessard Park in located in Edmonton. This proves that even business to business searches (perhaps this is business to consumer) will start to get hyperlocal given the opportunity. Fireworks, Calgary – I wanted to include this one, because when I lived in Pickering it was amazing to me how many people shoot off fireworks during holidays. I lived in Calgary and Saskatoon prior to moving to Pickering and this was not a normal thing in those cities to do. Now that I am back in Calgary, still not normal, yet it surprises me how many searches there are for it. Go figure. I will keep an eye out for more interesting searches to post in the future. In the meantime, if you have not already, check out YellowPages.ca and tell me what you think in my comments. This entry was posted in YellowPages.ca and tagged local businesses, YellowPages.ca on October 25, 2009 by Darby Sieben.